This weekend I visited Sarehole Mill. This is a 17th century watermill which when built would have been in rural Warwickshire but now a days is in a suburb of Birmingham. J.R.R. Tolkien lived within 300 yards of the mill between the ages four and eight, and would have seen it from his house. He has also said that he used the mill as a location in the Lord of the Rings. “It was a kind of lost paradise … There was an old mill that really did grind corn with two millers, a great big pond with swans on it, a sandpit, a wonderful dell with flowers, a few old-fashioned village houses and, further away, a stream with another mill. I always knew it would go and it did. – said Tolkien in an interview with Guardian journalist, John Ezard in 1966, before the mill’s restoration. Now pictures of the mill will have to wait for another visit because I did not see it this weekend (although I have visited a number of times in the past and actually worked at a practice in the area in the 90’s). Instead I spent most of the weekend in a marquee! For this weekend was Middle Earth weekend – a celebration of all thing Tolkien on a site out the back of the mill in an area with lots of Tolkien links. Moselely Bog – the inspiration for the midgewatermarshes and the Old Forest is just accross the road as is a house where Tolkien lived. 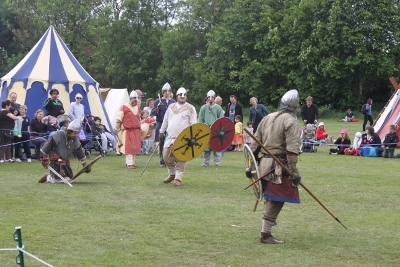 Half a dozen Marquees were constructed on the ground along with a couple of dozen tents belonging to Viking Reenactors. 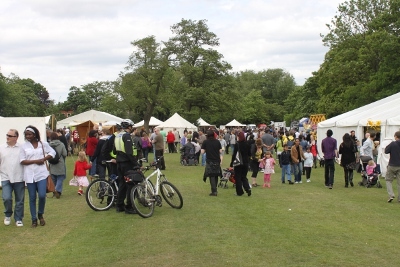 There was a craft tent, performance tent with readings from the works of Shakespeare and poet and a market selling reenactors costumes, plants, craft goods and several food outlets. The event had a good attendance of several thousand. I have been for several years now aiming to promote UK Games Expo and last year and this with my books as well. This year I had my 4 books on sale. To help advertise The Amber Treasure one of my friends who used to be a reenactor brought his armour and weaponry from his days as a Viking warrior. My trusty Hourglass and Tom Oakley’s Alarm Clock also featured and long with the Great Fire of London Painting. These sorts of occasions are attended by a mix of people but some at least are into Fantasy and History and so my books seem to go down quite well. Indeed it was this event last year where I really launched my books for the first time. I had lots of interesting conversations with people and did sell a number of books. 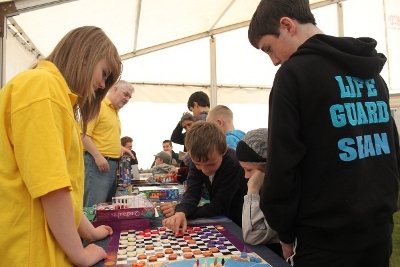 The event was also our last publicity event for UK Games Expo. We took along twenty of the new games that will come out at the show in 2 weeks and played them with many people as well as giving out flyers and talking to them all. 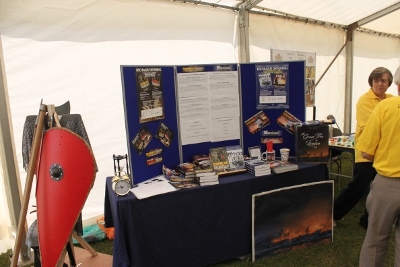 Hopefully many will come along to Expo – and the Middle Earth Weekend has always proven to be a great event for us. IN this shot you can see my daughter and in the middle ground Pat (one of the other Expo directors) whilst (in the distance) our Lord of the Rings Game being played. This is a combined effort with my wife, daughter, parents, fellow directors and also brilliant helpers Richie and Mike running the Moria game (and providing the armour! In our Amon Hen game the Fellowship has broken and Frodo must reach the river from the top of Amon Hen. the Fellowship have to fight off the orcs and given him a chance to get away. I was only able to take shots in quiet moments. Some times a great surge of people would enter in one go and it would be all hands to the pumps to try and talk to as many as we can. I learnt several years ago that you have to leap in and start talking and hopefully most folk will respond to your subject if you make it interesting enough. I have been at book fairs and games fairs where people dont talk to the visitors. Guys you HAVE to engage them. You cant just sit back and hope they will come to you. With the games we aim to have mostly simple, attractive and easy games. I love complex games but a lot of people are terrified of games. They say “oh that sounds complicated” or – grinds teeth – is that like monopoly? If you start to explain more than 4 rules they head for the door. So one learns you have to coax folk in with easy games and not hit them with the heavy weight ons until they are ready for them. Another cool thing about this weekend is the amount of reenactors who attend. Hopefully some of the Vikings will turn up at UK Games Expo in 2 weeks time. 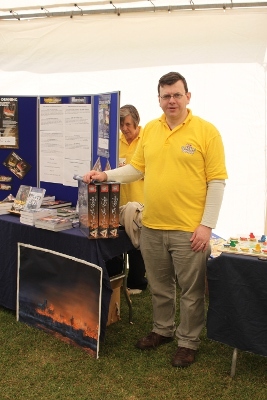 The Middle Earth weekend is a wonderful escape for me from the concerns of day – a chance to just enjoy meeting people, talking about books and games, drinking traditional lemonade as well as a rather nice curry from another stall and just relaxing. I do believe though that these occasions should be in the list of events to think about for an author to visit – if you can see an overlap with your subject matter then it can prove a good way to raise attention for the books. I wish that I could have been there! Thanks for the recap and the great photos!